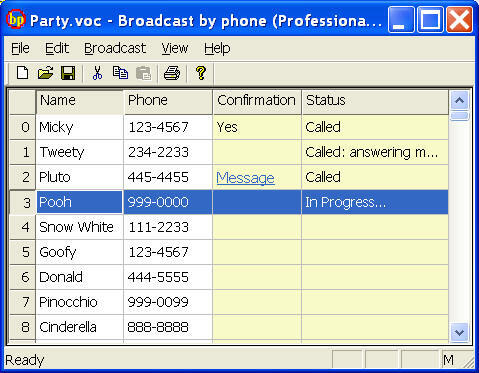 Automatic telephone notification software to broadcast voice messages by phone. Ideal for group event reminders, marketing or political campaign promotion, emergency notification and more. Spreadsheet interface makes it easy to create and/or import phone list. Simply record your message in an audio file, use the built-in calendar to set a call time. The program will make all the phone calls one by one by one like a robot and call status will be displayed while the call is going on. In professional version, the software has text to speech engine, message designer can play different and personal messages when human pick up vs. answering machine pick up. Many other features include: message replay over the phone by voice command; personalized message to each call number using text to speech and voice recognition technology; playing messages only for human or only for answering machine; retry when call fails or line busy; schedule for multiple call lists in advance using built-in calendar; do-not-call check list; dial internal extension(x1234), outside line (prefix 9…), international number or any number you provide; plus many more cool features. Check out Voicent website: http://www.voicent.com. Very easy to download, install and use. Just one click on the download and the installation will follow. Click on BroadcastByPhone icon installed on your computer, enter call list or import existing phone list and click on Start call on broadcast pulldown menu. If you haven’t prepared your voice message, check out Quick Start Guide on how to record your voice messages. Make sure to connect your modem to a working phone line. Minimal hardware requirement: PC running Windows XP or 2000, a voice modem and a good sound card so the message played over the phone doesn't sound muffled. The software can work with either regular phone line or Voice over IP. A free download is available. License and support can also be purchased. A must have PC telephony software. Try it now!